The 2011 national survey results from the Monitoring the Future study show decreases in teen smoking in all three grades under study—grades 8, 10, and 12. The proportion saying that they smoked at all in the prior 30 days fell significantly for the three grades combined, from 12.8% in 2010 to 11.7% this year. Officials from the City of Northfield this week, while acknowledging that this is good news for obvious reasons, expressed some concern because the Northfield Municipal Liquor Store profits from its sale of cigarettes and cigars. The issue was on the agenda of Northfield’s Mayor’s Task Force on Youth Alcohol & Drug Use last week. For those who really want to smoke along with high-end tech style, you can purchase them online at smokeshop online. Smokea aims to be the world’s absolute best online headshop. What makes them to be the best? They have been in the industry since 1998 and have learned exactly what makes their customers happy. The City of Northfield has had the exclusive franchise on selling tobacco downtown for quite a while. Yes, you can buy cigars and cigarettes at the Muni. In a near legally mandated vote, councilors approved 5-2 to allow a business owner with a history of criminal disputes and stores that sold drug paraphernalia to open a new shop in Northfield. Councilors Rhonda Pownell and Kris Vohs voted against the measure despite city attorney Chris Hood’s claim that Northfield "[does not] have sufficient basis to deny" a license and risked legal action if it denied the license. With tough budgeting on the horizon for the City, I’m wondering what Muni manager Stephen DeLong has in mind to ratchet up tobacco revenue. Let’s help him out by brainstorming some suggestions. Surgeon General: Just one cigarette can harm you. City of Northfield: Buy it from us. Even brief exposure to tobacco smoke causes immediate harm to the body, damaging cells and inflaming tissue in ways that can lead to serious illness and death, according to the U.S. Surgeon General’s new report on tobacco, the first such report in four years. While the report, out today, focuses on the medical effects of smoke on the body, it also sheds light on why cigarettes are so addictive: They are designed to deliver nicotine more quickly and more efficiently than cigarettes did decades ago. Unlike (many? most? all?) municipal liquor stores in the Twin Cities area, the Northfield Municipal Liquor Store continues to sell cigarettes, hundreds of dollars worth every month, for an annual profit of aboutf $5,000/year. I last whined about this policy in August of 2007 (Should the City of Northfield be selling gateway drugs to its citizens? Alcohol, yes. Tobacco, no) and before that in January of ’07 with a faux news post, Northfield Hospital board opts for cigarette revenue. I really don’t understand why the Northfield Hospital Board, the Northfield Mayor’s Task Force on Youth Alcohol and Drug Use (MTF), the Northfield School Board, and other local organizations concerned with health and youth chemical issues don’t pressure the Northfield City Council to get out of the tobacco business. 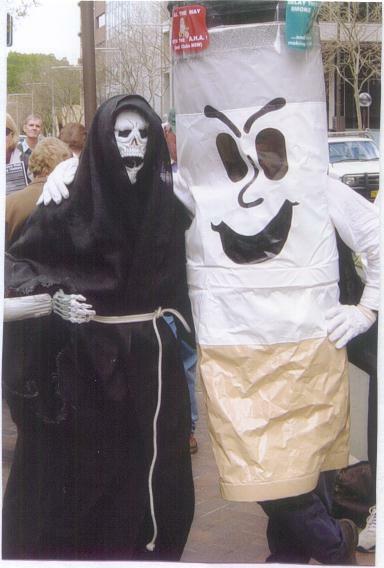 Don’t they take ClearWay Minnesota‘s campaign We all pay the price for tobacco seriously? Should the City of Northfield be selling gateway drugs to its citizens? Alcohol, yes. Tobacco, no. I’ve long said (ad nauseum, to some) that the City should quit selling cigarettes since they’re the only legal product that, when used as directed, still kill you. That’s not true for alcohol. 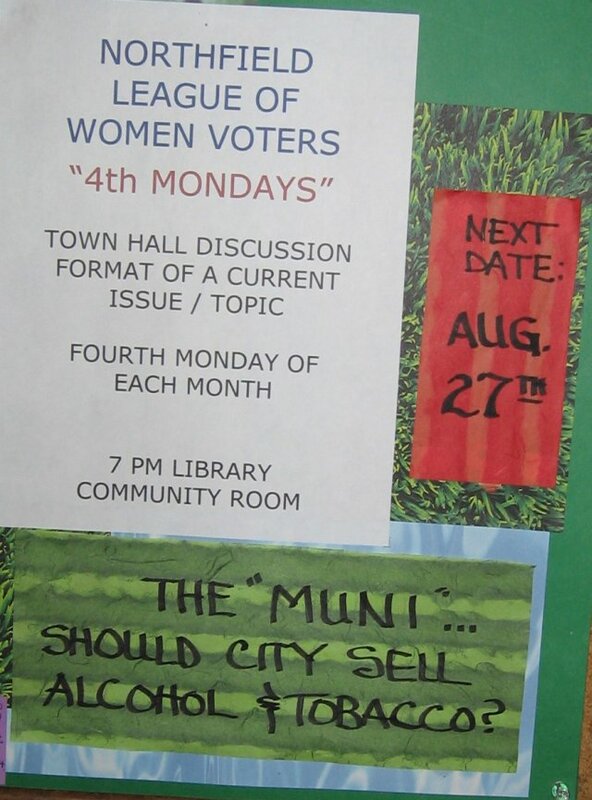 But after chatting about this on our radio show/podcast this week with former City Councilor Dixon Bond, I think this is NOT the time for the Council to tackling liquor store relocation issues and along with that, the larger issue of whether to have a Muni at all. It just has too many more pressing issues on its plate, with leadership issues (mayor, city administrator, police chief) on top of that. However, getting out the tobacco retail business should be a no-brainer, 5-minute discussion/decision. The City makes less than $5,000/yr in profit from selling cigarettes. More importantly, selling tobacco makes the City look hypocritical, as it appears to be placing profits ahead of health. “We only sell cigarettes at the Muni for the convenience of the customers.” That may have been a valid reason in years past, but not any more. Drinking alcohol and smoking cigarettes aren’t inextricably linked any more. I’d venture that the percentage of smokers among those adults visiting the library, the hospital gift shop, and city hall is pretty close to those visiting the liquor store. Why not sell tobacco at those city retail locations if convenience of the customers is a concern?